Dimensions 351' by 34'9" by 9'2"
The Tjerk Hiddes class was designed with British assistance to be a better match for Japanese destroyers than previous Dutch destroyer classes, and it had probably the most advanced fire control of any destroyer in the world in 1938. The units of the class were still under construction when war broke out in Europe, and only the Isaac Sweers was close enough to completion to be towed away before the Germans overran the shipyards. 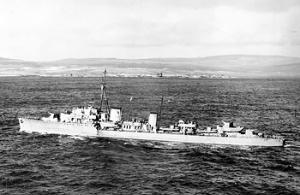 She was completed in Britain.